Why study the mosque? For historians of architecture and culture alike, the answer is gratifyingly simple. This is the Islamic building par excellence, and as such the key to Islamic architecture. Moreover, the medieval Muslim world, like medieval Europe, was a theocentric society, and the mosque was the natural expression of that society. To examine its functions in detail therefore affords insights into the workings of medieval Islamic culture. For historians attuned to material culture as well as written evidence it is a primary source of the first order. larger quantities than any other type of medieval building. Indeed, the early period of Islamic architecture—from about 700 to about 1000 A.D.—is documented largely by mosques. It was the mosque that embodied the first timid Arab experiments in architecture and it was in the medium of the mosque above all that Muslim builders came to grips with their pre-Islamic architectural heritage. As a result, this is the building type that most faithfully reflects—like the church in the Christian world—the impact of the many distinct local architectural traditions that together shaped Islamic architecture. It seems appropriate to attempt a definition: The mosque is the principal religious building of Islam, and paramount among its many functions is communal prayer. In its simplest and most widespread form the medieval mosque comprised a courtyard bordered by arcades adjoining a covered hall. Yet this definition, for all its deliberate inclusiveness, gives little idea of the nearly endless variety of forms and uses that characterized this most quintessentially Islamic building. Nor does space permit a reasonably detailed inventory of the significant mosque types and their functions. It is imperative rather to distance oneself from this wealth of detail to better identify the immanent characteristics of the mosque and to appraise its unique role in Islamic culture. Accordingly this essay will focus less on close analysis of individual mosques than on how the genre expressed the perennial concerns of Islamic religious architecture. These concerns, or underlying principles, governed and are reflected in the choice of component parts of mosque design and their interaction; the functions the mosque was called on to perform; the role of decoration; and finally all that contributes to the visual and aesthetic impact of this building type. Mosque architecture is at base egalitarian, iconoclastic, inward-looking and above all profoundly religious in its intent. The latter aspect deserves particular emphasis because of the much-vaunted identity of the sacred and the secular in medieval Islamic society. This theory, a favorite construction of some trends in modern scholarship, is ideally as true of Islam as of Christianity. It is, however, only a theory and a glance at common practice is enough to dispose of it. To this day no one walking from the bustle of a bazaar to the serenity of a mosque can seriously doubt that Islam clearly distinguishes between the dues of Caesar and those of God. The architecture proclaims that very distinction. The believer takes his shoes off to enter a mosque, and that simple, homely action symbolizes the transition from the secular to the spiritual realm, just as the same action performed in a domestic context marks the transition from the public world to the private one. In just the same way, the physical evidence contradicts another fashionable concept: that all parts of the mosque are equally sacred and that its architecture embodies no hierarchy of importance. In mosques provided with a courtyard—and such mosques predominate throughout the Islamic world—a clear visual distinction is drawn between the courtyard with its surrounding arcades and the larger covered space containing the mihrab, or prayer niche, which is always oriented toward Mecca. Even the Arabic language singles out this area from the rest of the mosque, calling it the musalla (“place of prayer,” conventionally rendered into English as “sanctuary”). Similarly, it is in this area that the principal architectural and liturgical elements of the mosque are concentrated: the main dome, the largest continuous covered space in the building; the mihrab; the maqsura, or royal box; and the minbar, or pu.pit. Finally, it is in the musalla that the most lavish ornament that the building can boast is to be found. This is not to say that the mosque as a whole is not sacred. Nevertheless it implies that one part—the musalla—was accorded greater visual emphasis and status than the rest of the building. The origins of the mosque are surprisingly straightforward. Islamic tradition champions the decisive impact of a single building on the evolution of the mosque—the house of the Prophet. Nor is this emphasis misplaced. The briefest acquaintance with Muslim liturgy is enough to explain why the places of worship employed by the other faiths of the time were fundamentally unsuitable for the needs of Islam. Actually many churches and fire temples, and on occasion even port.ons of Classical temples, were adapted to serve as mosques, but this was only a matter of expedience, never a long-term, deliberate policy. It did, however, have its uses; indeed, several motives could account for these conversions. In newly Islam-ized territory the pressing need for a place of worship could not always be met as quickly as might be wished. The advantages of using an already existing monument—convenience, low cost, suitable location, the saving of time and effort, and the less easily definable proselytizing, propaganda, and symbolic elements—outweighed the initial disadvantage of using an architectural form not designed to serve as a mosque. Nevertheless, these disadvantages made themselves felt quickly. Christianity offers an instructive parallel case, except that from the beginning it was less flexible than Islam in its attitude toward places of worship. Pagan temples were not taken over en masse; nor for that matter were the buildings of other cults. Instead the earliest churches were the so-called tituli—ordinary-private houses that doubled as places of worship. When changed political circumstances allowed large-scale churches to be built, models from other genres of architecture, notably the basilica, or law court, and the mausoleum, were pressed into service. Islam was able to draw on a much more varied range of models for cultic buildings than was Christianity, which says much for the simplicity of Islamic communal worship and its refusal to be tied down to a narrow range of architectural expression. Its austerely simple liturgy meant that Islam could appropriate almost any kind of building for worship. Even so, there was—at least as far as seventh-century Arabs were concerned—an optimum design for mosques, and it is revealing that its roots should be in domestic rather than public architecture. This is not to say that the mosque is simply the Arab house writ large, for both Christian and Zoroastrian places of worship left their mark upon its design, as did the aulic architecture of late antiquity. These external influences, however, took time to make an impact on mosque architecture, and even at their strongest they were only rarely the determining factor. The Qutb Minar, Delhi, India. Qutb Minar is 238 feet high—and could not have served their purpose of calling the faithful to prayer satisfactorily. Mature Ottoman mosques, which cannot be understood without reference to Byzantine churches of the sixth century, notably Hagia Sophia, are the exception that proves the rule. Muslim architects happily plundered, both literally and metaphorically, the religious architecture they encountered in the Mediterranean, Arabian, Persian, and—nearly six centuries later—Indian worlds. Yet the materials and ideas they quarried from these buildings were not enough to make the mosque an Islamized church, fire sanctuary, or temple. The places of worship used by the adherents of religions that Islam supplanted were basically ill-suited to Muslim needs. Churches emphasized depth rather than breadth if they were basilical in form and centrality if they were variations of the martyrium type. The sanctuaries of fire worship in the Persian Empire were built for ceremonies involving a few priests, not large congregations—indeed, the congregation gathered in the open air—while the temples of Arabia and India also put no premium on housing great numbers of worshipers within a covered hall, let alone ensuring easy visibility among them. For these practical reasons the cultic centers of other religions were of limited value to early Muslim architects, who accordingly looked elsewhere for inspiration. It was Prophet Muhammad’s house at Medina from which the mosque developed in its crucial formative stage, and it is therefore sensible to examine this building in some detail. The house was demolished within a century of its erection to make room for the Mosque of the Prophet, intended by the caliph Walid I to be one of the principal sanctuaries of Islam. The characteristics of the original building are, however, preserved in the numerous accounts of the Prophet’s life, and the details of the structure given in these sources agree tolerably well. It was roughly square, measuring some 56 by 53 meters, and by far its most prominent feature was the great empty courtyard, which took up well over 80 per cent of the surface area. Thus both austerity and ample open space were embedded into mosque design from the very beginning. On the south side was a double row of columns, eighteen to a row, with a roof of mud and palm leaves to give shade; here the early believers worshiped. 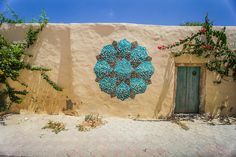 Along the southern flank of the east side was a row of nine huts that housed Prophet Muhammad’s wives; this was the sole concession to domesticity. The vast courtyard sufficed to proclaim the essentially public nature of the building. It quickly became the nerve center of the burgeoning Muslim community, where worship was conducted, public announcements made, meetings held, parades reviewed, cases tried, the treasury housed, and councils of war convened. Like the religion of which it quickly became a potent symbol, it encompassed both the spiritual and :he secular domain. Later mosques in theory maintained this dual allegiance, and the lack of formal urban institutions in rhe Muslim world, with a corresponding lack of certain types of formal public buildings such as town halls or law courts, put a premium on this double role. Thus by a natural process it became the community center of the new faith. Larger mosques in particular continued throughout the medieval period to offer a more or less wide range of facilities unconnected with worship. Smaller mosques on the whole did not. This functional distinction reflects a difference in status and purpose that became established within a century of the Prophet’s death and was formalized by the adoption of two quite separate terms, both meaning mosque: masjid and jami. Masjid, derived from the root sajada, “to prostrate oneself,” is used in the Koran itself, though in rather a broad sense, to denote a place of worship. Its meaning was quickly refined to indicate more specifically a mosque for daily private pra>er. The simplest architecture, right down to a single unadorned room, sufficed for such oratories, though it was not rare for splendidly embellished masjids to be erected at the behest of some wealthy patron. No Muslim community was without a masjid, even if it was no more than a small space set aside in some larger building. In towns it was common practice for each individual quarter to have its own masjid, and yet other masjids were built specifically for members of a certain tribe, sect, profession, or other exclusively defined community. Finally, the growing popularity of joint foundations from the tenth century on meant that masjids were built in association with a wide range of buildings whose prime emphasis was secular, such as caravansaries, mausoleums, and palaces, as well as buildings with an overtly religious significance, such as ribats, castle-like structures that housed warriors for the faith, and madrasas, or Koranic schools. This association of the masjid with secondary places of worship ensured that the physical form of the rnasjid would become more and more varied. The jami was an altogether more ambitious kind of building, which was entirely in keeping with its much grander function. The religious obligation imposed on every adult Muslim, male and female, to meet for communal worship every Friday for the sabt, or public service, created a need for a building conceived on a much larger scale than the masjid. The very word jami, which derives from the Arabic root “to assemble,” recalls and perpetuates this crucial function of the building. It had to accommodate thousands instead of scores or a couple of hundred. It had in addition a public role, with undertones of symbol and propaganda perforce denied to the masjid. It was in some sense a showpiece for the faith and often for the person, dynasty, or area most closely associated with it. Not surprisingly, the crucial experiments in the evolution of ‘he mosque as well as the first realizations of it, have been reserved for the jami. The Western term “cathedral mosque,” though obviously a solecism, is thus an appropriate transference of ideas. The building of a jami was no more to be undertaken lightly than was that of a cathedral. Indeed until the tenth century the express approval of the caliph was required before a jami could be erected, and for centuries only one such building per city was permitted. Gradually, however, the population pressure in the major cities forced a relaxation of this-rule. Despite the clear functional distinction between masjid and jami, there was not necessarily any corresponding distinction between the two building types so far as their basic layout was concerned. The generalizations at the beginning of this chapter therefore hold good for both genres of mosque. True, the jami normally had an extra dimension not only literally, by virtue of sheer size, but also metaphorically, because of its extra degree of embellishment. Yet often enough masjids were built that yielded nothing in decorative splendor to the finest jamis of the same style. Certain types of jami, however, especially in the early centuries of Islam, did develop certain distinctive features not encountered in masjids, though it must be emphasized that these features represent only minor modifications to the basic schema of open courtyard and covered sanctuary common to both masjid and jami. Their introduction is of key importance to the history of the mosque, for it heralds an influx of foreign ideas, techniques, and materials that decisively transformed the primitive Arabian simplicity of the mosque. Henceforward mosque architecture evolved against a backdrop of Classical, Byzantine, and Persian influences. As a result, from the later Ommiad period on the physical form of the mosque was unmistakably rooted, at least in part, in the millennial traditions of the Near East and the Mediterranean world. The masjid in its original form was well able to do without these addenda, but there is no doubt that their incorporation into mosque design substantially enriched the whole subsequent development of the genre. These new features were five in number: the mihrab, the minbar, the maqsura, the raised gabled transept, and the dome over the mihrab bay. Not all of them were to be of equal importance, nor were all to be encountered often in the same building. In the context of the present general discussion it is less their individual evolution than the motive behind their introduction that is relevant. Their origins are unmistakably Classical, filtered and in some measure distorted through the medium of Byzantine art. Significantly this latter connection is both religious and secular, whereas in Classical art proper it was the secular milieu in which these features were most at home. Their final incarnation in a Muslim religious building is therefore simply the logical fulfillment of a process begun many centuries before. The readiness with which Islam adopted these five features, and the natural way in which they acquired a liturgical raison d’etre, speaks volumes for the powers of assimilation possessed by the new religion. Dome over the musalla of the Qarawiyyin Mosque, Fez, Morocco (top), and an exterior view of the mosque at Abdallahbad, Iran (above). The dome was often used to visually emphasize the musalla. The choice of these particular alien features is interesting on other grounds too. All have a close connection with palace architecture and court ceremonial, an element that was overlaid by an ecclesiastical veneer in the Byzantine period but still retained its original potency. The evocative power of these architectural symbols was thus virtually undimmed when Islam adopted them. The mihrab is perhaps the clearest case of all. The deeply recessed arcuated niche could hold a cult statue in a Greco-Roman temple or the emperor in person in a late-antique palace. Writ large, it contained the altar of a Christian church; correspondingly reduced in size, it did duty as a mihrab, though even in the context of a mosque some vestigial memory of its original function lingers, in that at the Friday salat the imam, or prayer leader, stands within the mihrab to lead the worshipers. The fact that it was part of the caliph’s duties to act as imam vividly illustrates the capacity of the new faith to reconcile in a new synthesis the hitherto conflicting demands of church and state. The innate interchangeability of this feature is perhaps most revealingly illustrated in the late-Omrr.iad palace of Mshatta. The triconch form of the throne room, which terminates the main processional axis, finds its closest counterparts in a sixth-century cathedral and bishop’s palace in Busra, in southern Syria. The architectural form is the same in all three cases, even though the great central niche is put to different uses in each: to hold the altar, the bishop’s throne, and the caliph’s throne, respectively. In due course the same form entered the vocabulary of mosque design, with a mihrab set within the central niche. The mihrab was not an absolute requirement of any functioning mosque, and it should be remembered that the earliest example dates from as late as 705, when the rebuilt Mosque of the Prophet at Medina was furnished with one. There is no question, however, of the earlier mosques, which lacked mihrabs, being regarded as somehow deficient for that reason. In a properly oriented mosque the entire wall that faces the Ka’ba, the holy Black Stone at Mecca—the so-called qibla wall—serves as a directional indicator. It thereby makes the mihrab superfluous. Thus it was no liturgical necessity that called the mihrab into being. The evidence suggests rather that a growing desire to secularize the mosque, or at any rate to bring it more into line with the highly developed architecture of the ancient Near East and of the Classical and Byzantine world, was the decisive factor. Once “invented,” the mihrab was so obviously a signal success as a symbol and as the cynosure of worship that its future was assured. The various types of mihrab that were ultimately developed—flat, concave, or recessed so as to form a separate chamber—are so varied as to demand a study beyond the scope of this account. The minbar never attained the nearly universal popularity of the mihrab in Islamic architecture. To begin with, its function is much more specifically concentrated in the Friday salat and thus in the jami, whereas the mihrab quickly became an essential component of even the humblest masjid and is frequently to be found also in madrasas, mausoleums, caravansaries, and other kinds of buildings. An integral part of the Friday service was the khutba, part bidding prayer, part sermon, and part formal address. This element of the service had a strong political flavor. Indeed, a ruler’s claim to legitimacy depended, inter alia, on the formal mention of his name in the khutba. Like the diptych in Byzantium, the khutba thus became an instrument for affirming allegiance. Clearly it was important for the khatib, or preacher, who delivered the khutba to be easily visible and audible; hence the development of the minbar, which was customarily placed immediately to the right of the mihrab. The obvious analogy to the minbar in Christian practice is of course the pulpit, and in fact the closest known prototype to the minbar is the ambo, the lectern and pulpit found in early medieval churches as well as the bishop’s throne in Byzantine ones. Coptic churches in particular had ambos with the same striking simplicity of form found in minbars: a primitively stepped right-angled triangle set against a wall. No minbars securely datable before the early ninth century have survived, however, so that the precise relationship between the Muslim form and its presumed Christian prototype is hard to determine. Mihrab and minbar of the Tari Khana Mosque. The mihrab is a recessed niche indicating the direction of prayer. The minbar is in this instance unusually built in. This problem is compounded by the existence of alternative hypotheses on the origin of the minbar. One of these holds that the later minbar is simply a monumental version of the raised chair from which Prophet Muhammad addressed his followers. No trace of this has survived, which makes it impossible to follow up the proposed connection in any detail. The other theory associates the minbar with the raised throne from which the Sassanian commander-in-chief reviewed the Persian army. Here again, the lack of physical evidence scotches any extended discussion. The irritating gap of two centuries or more between pre-Islamic Christian ambos and the earliest precisely datable minbar, generally held to be the teakwood specimen in the Great Mosque at Kairouan in Tunisia, may not, however, be quite the obstacle it seems. A comparison of the example at Kairouan with the ambo of a typical Coptic monastery, like that of Apa Jeremias at Saqqara in Lower Egypt, reveals sufficient basic similarity of form to justify the analogy. The built-in minbar in the Tari Khana Mosque at Damghan in Iran, perhaps as early as the eighth century and scarcely likely to be any later than the year 900, provides an even closer parallel to the Coptic ambo and is moreover of mud brick rather than wood. Since mud brick is a traditional Persian substitute for stone, the stepped triangular form used at Damghan can most conveniently be interpreted as a translat.on of the Coptic stone ambo into the most closely related material available. Perhaps the simple stone, brick, or mud minbar coexisted with a more elaborately developed version executed in wood. The latter type was sometimes wheeled, and could therefore be brought out into the courtyard when a particularly large congregation had gathered. The link with princely life had already been established in the early-Ommiad period, for it is recorded that the caliph Mu’awiya I took his minbar with him on his travels. It is tempting to assume that it was a mmixzr of this type that Prophet Muhammad himself had used. Certainly the minbar served in early Islamic times as a kind of throne from which the ruler could address his subjects or receive their allegiance, often in the form of a bay’a, or oath. The example at Kairouan is typical of the subsequent development of the minbar, though minor modifications and improvements were introduced over the centuries. In order to boost the acoustic properties required by the very nature of the minbar, for example, a canopy, often polyhedral in shape, capped the upper platform or landing, performing much the same function as a tester in European pulpits. A hinged gate often gave access to the steps, again in somewhat European fashion, though there is no need to postulate any direct influence in either direction. Supplementary minbars—and for that matter supplementary mihrabs—were sometimes placed elsewhere in a jami, for example in the courtyard, perhaps carved out of rock in an open-air mosque, or in an ‘idgah (a mosque for extraordinary’ intercessory prayer at the time of the two great ‘ids, or festivals), or in times of drought, famine, and the like. The decoration of minbars was by some quirk of tradition remarkably stereotyped. Their wooden construction laid a premium on the use of many small modular units that on being fitted together created the overall pattern, which was nearly always geometric, though some of the early surviving minbars, such as those at Fez and Marrakesh, favor floral designs. From the fourteenth century on more varied types of minbar appeared. Examples sheathed in tilework were erected in Persia and increasingly in Ottoman Turkey. The latter area also favored stone or marble minbars with banisters of elaborately fretted openwork tracery. Minbars of iron and baked brick also exist. In general the use of durable materials brought in its train a markedly simplified design; as late as the seventeenth century, in Safavid Isfahan, a minbar could be built that exactly repeated the shape of the Damghan example of a millennium earlier, but with costly marble instead of mud brick. Far fewer examples of the maqsura survive, and it is likely that this situation reflects their relative scarcity in medieval times. The reason is not far to seek. Much more explicitly than either the mihrab or the minbar, the maqsura implies the presence of a ruler. By contrast, every jami requires an imam and a khatib. In form, the maqsura is a separate, usually square, enclosure within the mosque and close to the mihrab. Its walls may be of masonry, but wood or metal latticework is more common. This sufficed to screen the occupant from the other worshipers but allowed him to see and participate in the ‘salat‘. Several reasons may account for this seclusion. One could have been a desire straightforwardly to adapt the Byzantine practice of housing the emperor in a royal box, the kathisma, and thereby to emphasize his high rank and his essential apartness. Another, related motive might have been to secure privacy of worship for the ruler. 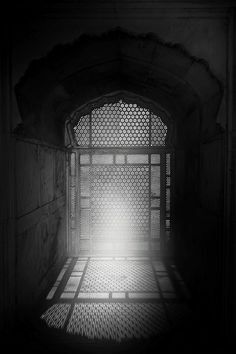 This might explain the frequent provision, as at Damascus, of a door beside the mihrab communicating both with the royal palace and with the maqsura. Thus the ruler would have been absolved of the need to mingle with other worshipers. Such exclusiveness would have been of a piece with the growing emphasis in the Ommiad period on the remoteness of the caliph, a far cry from the unpretentious democracy of Arabian practice. A third reason might well have been a naked fear of assassination. Two of the first four caliphs, Omar and Ali, were murdered in the mosque, and a third, Othman, was killed while reading the Koran. Behind the maqsura screen the caliph was visible but not vulnerable. The emphasis on openwork screens in the typical maqsura opens up the possibility of a formal connection with the choir screens that were a marked feature of Byzantine architecture. These too were located close to the liturgical fccus of the building. Whatever the origins of the maqsura, its symbolic function can scarcely be in doubt. It was a visible exaltation of the ruler’s rank and therefore an integral part of the strong secular element in the early Islamic jami and of its intimate connection with royal pomp and ceremony. The subsequent history of the maqsura betrays a weakening of these associations. The word came to mean the detached part of a mosque set aside for communal as distinct from private prayer. As such, naturally, its form underwent a major change. From the eleventh century on maqsuras in the form of large domed chambers incorporated into the sanctuary of a mosque began to proliferate, especially in the eastern Islamic world. The example of the mosque of Baybars in Cairo shows that this fashion penetrated to western Islam too. As with the minbar, the maqsura appears in a variety of forms and contexts, among them mobile examples in wood (as at Kairouan) and others in multipurpose foundations such as the complex of Sultan Qala’un in Cairo. Musalla interior of the Mosque of Arhai-ka-din-Jhonpra, Ajmir, India. The twelfth-century mosque consists of an open hypostyle hall preceded by a massive screen of seven arches. For all its symbolic importance and the physical impact its sheer size guarantees, the maqsura could not claim to have any significant liturgical role even when it came to connote the domed sanctuary itself. This is even true of the two remaining features of foreign origin that were incorporated more and more often into large urban jamis: the raised gabled transept and the dome over the mihrab. The transept never attained any great popularity, if only because it was not a form that could be imposed on all kinds of mosque. Far from it; to make its desired effect the transept called for a sanctuary whose roofing system extended parallel to the qibla, not perpendicular to it. The whole purpose of the transept was to assert an axis at variance with the preponderant one in the sanctuary and thereby to emphasize the mihrab, which terminated the axis thus highlighted. The extra height of the gabled transept, towering above the sanctuary and driving at right angles across its roofline, was the outward visual embodiment of this processional way. By a fortunate chance the mosque that first expressed this idea was one of the supreme generative buildings of Islamic architecture, the Great Mosque of Damascus. The transept was recognized at once as an integral part of the Damascus schema, and in one form or another it is reproduced in all mosques that depend upon that prototype. However, it has no locus in mosques that derive from other sources, and these constitute the vast majority. Clearly, then, it is in no sense an obligatory or even a customary part of a mosque. Accordingly the obvious question is why was it introduced in the first place? It must suffice to outline the two most likely-possibilities. First, the wholesale transposition of the west front of a typical Syrian church to serve as the centerpiece for an interior mosque facade must have overtones of triumph in political and religious terms if indeed it is not to be interpreted as outright parody. Such a deliberate reformulation of the components of an established style is a typically Ommiad proceeding. Even so, the second possibility—a connection with princely ceremonies—seems more likely. By that reckoning the key parallel would lie not in religious architecture at all but in palaces, whether gubernatorial as at Ravenna, episcopal as at Busra, or imperial as at Constantinople. In all these contexts the gabled facade encloses an arched entrance that gives onto a processional way. The latter customarily leads to a throne room. There is of course no throne room in a mosque, nor is there any provision in the Koran or in earliest Islamic practice for formal royal receptions in the mosque. Nevertheless the processional entry of the caliph or sultan into the jami for the Friday salat was a long-established tradition in the medieval Islamic world. The gabled raised transept, the dome over the mihrab, and eventually the maqsura, minbar, and ruTi-rab would together create an architectural mise en scene that would be the natural corollary to such pomp and circumstance. A comparable and much better documented process may be observed in Western medieval architecture. The significant progeny of the transept in the Great Mosque at Damascus is to be traced almost exclusively in the western Islamic world. The easternmost limit of its influence is probably the Great Mosque at Diyarbakir in Anatolia. Interestingly enough, the mosques in Egypt that repeat the transept motif, though relatively few in number, include some of the finest mosques of their time, those of AI-Azhar, Hakam, and Baybars. This suggests that when the transept motif traveled outside the confines of Syria it retained its royal associations. In time its form became simplified so as to allow a smoother integration into the courtyard facade, of which it was the cynosure. This is particularly noticeable in the major Maghribi mosques, where the greater breadth of the transept vis-i-vis the flanking aisles is maintained intact, but its external silhouette rises much less markedly above the rest of the roofline. Most significantly, the basic notion of the conflicting axes crucial to the transept form is lost. In these Maghribi mosques the aisles are all perpendicular to the qibh, and it is only by its greater width, height, and vaulting that the central one stands out. In the long nin, therefore, the concept of a transept proved to be an aberration within the context of Islamic architecture as a whole. Finally, what of the dome over the mihrab? Roman architecture had decisively established the honorific character of the dome by giving it pride of place in palatial architecture. It is no accident that the greatest of all Roman religious edifices, the Pantheon, makes the dome its focal point. These lofty associations did not prevent the Romans from using :he dome in humbler contexts, but a pattern had been set and was confirmed in Byzantine architecture by the large-scale use of the dome in churches and monasteries. It was therefore a natural transition to employ it in mosques, and incidentally in key locations within Islamic palaces. Within the mosque the obvious place for the dome was near the mihrab, as part of an intricate nexus of royal associations established by that feature, the minbar, the maqsura, and the transept. Each of these elements derives added impact from the nearness of the others. In a mosque with principally flat or pitched roofs or at most shallow vaulting, the presence of a full-scale dome is obviously intended to emphasize some liturgical focus if not to express some religious or political symbolism. Given the fact that the mihrab, even when it projects slightly beyond the rest of the external qibh wall, is essentially part of the interior formulation of the mosque and that its position is therefore not readily identifiable from the outside, the value of the dome as an outward sign of that spot is obvious. More than that, its form, with its rich inbuilt secular associations, emphasises the princely role of the mihrab. Finally, it marks the location of the qibla, an important consideration in an urban setting otherwise devoid of fixed directional points. The dome over the mihrab proved to be one of the most durable and versatile aspects of medieval Islamic architecture. By degrees its usefulness as a distinguishing mark won such recognition that the idea was applied on a more extensive scale. Pairs or trios of domes over the mihrab, maqsura, and transept area or along the center stretch of the qibla wall multiplied the effect. A favorite combination for Islamic architects was to mark the erstwhile transept, now reduced to simply a larger central aisle, by a dome at each extremity or to assert the qibla wall by a dome at each end and one in the middle. These architects composed their buildings with an eye to the overall design, using domes like grace notes to punctuate the regular beat of an articulated wall or a peristyle. This specialized architectural context did not, however, entirely divest the dome of its traditionally weighty secular and religious associations, even when the popularity of domical architecture was at its zenith. As late as the high-Ottoman period a clear hierarchy based on gradations of size ensured that the principal domes were suitably highlighted by the diminutive scale of the surrounding ones. Mihrab of the Friday Mosque, Nain, Iran. This superb early example shows plaster decoration at its richest. caliph from the conduct of the Friday saht. As the caliph delegated those of his functions that bore directly on the Friday service to the imam and the khatib, the motive for singling out those parts of the mosque especially connected with the royal presence disappeared. The five princely components of the mosque are far from exhausting the tally of its constituent parts, some of which are of equal or even greater importance. The minaret, the courtyard, the covered sanctuary, facilities for ablutions all play a significant role in the overall design of a mosque, to say nothing of such lesser facilities as a dakka (raised platform), carpets or other floor coverings, and latrines. These various aspects of mosque design must be given due emphasis in the context of the present discussion. notable for his stentorian voice. The Persian guldasta, a diminutive kiosk perched on the roof of a mosque, usually over the crown of an itvan (deep vaulted hall), perpetuates this custom in monumental form, although nowadays the kiosk is more likely to contain a loudspeaker than a muezzin. Two distinct origins have been proposed for the minaret, and it is quite possible that both theories have a solid foundation of fact. Both derive strong support from etymological arguments. According to one hypothesis, the form derives from the towers of Syrian churches, which served as campaniles. The fact that a popular early term for minaret was sauma’a (monk’s cell) strengthens this supposition. Even today the minarets of the Maghrib, which alone in the Islamic world have continuously preserved the form of these early minarets in Syria, are known by this name. Given the central role of Syria in the formation of Islamic architecture, it might well be concluded that church towers are the best parallel, both functionally and geographically, for the minaret in the initial stages of its development. North facade of the Friday Mosque courtyard, Isfahan, Iran, with one of the four iwans placed axially on the domed chamber of the musalla. The second theory turns on the standard word used for minaret in Islam: manara and its variants. The word means “place of fire” or “place of light,” and while this could be taken in a purely metaphorical way—i.e., a tower spreading the light of Islam—it is surely more straightforward to assume that some reference to a signal tower is intended. In that case the obvious parallel would be the great lighthouse at Alexandria, the Pharos, which was still functioning at the time of the Arab conquest. The distinctive stepped silhouette of that Wonder of the World does in fact recur in some minarets, such as that of the Great Mosque at Kairouan, but it is far from certain whether any such minarets were built in the crucial first century of Islam. The custom of putting lights in minarets is, however, recorded in Persia and elsewhere in the medieval Islamic world, not only for purposes of signaling— for example, in the desert or on the seashore—but also to celebrate the ‘ids or other special occasions. Technically redundant though it was for the purposes of Islamic worship, the minaret had a symbolic and propaganda function that was quickly recognized. Indeed, among the very first minarets were those of the Damascus mosque, where the corner towers of the ancient temenos, or sacred precinct, served to proclaim the victorious new faith to the conquered Christian town. Soon the message was driven home, for these square corner towers were heightened dramatically. It is a moot point whether the intention behind this was indeed to harp on the theme of victory, but it must be conceded that no imaginable liturgical need would call for a quartet of minarets. Occasionally in later centuries tall minarets situated in remote or commanding locations and raised by rulers in the wake of some great victory might again invite the suspicion that the motive behind their erection was political rather than religious, especially when they were so high that a call to prayer made from their crown would be inaudible. Minaret of the Wazir Khan Mosque, Lahore, Pakistan. The brick walls of the seventeenth-century Wazir Khan Mosque are covered with glazed-tile mosaic. These examples are exceptions. The standard formula of a slender minaret towering over a relatively low mosque has long been accepted as emblematic of Islamic architecture, as a symbol of Islam itself. This is not to deny that in larger settlements the minaret is a much more practical way of making heard the adhan (call to prayer) than is a rooftop. Continuity with the past, religious symbolism, and functional appropri-ateness are therefore combined in a single, architecturally elegant form. There is no standard location for a minaret. At first a favored position was at the far end of the courtyard, opposite the sanctuary on the axis of the mihrab; later minarets were often placed in a corner of the courtyard or even outside the mosque. In time the possible options were extended still further by increasing their number. Paired minarets often soaring higher than a hundred feet at the main entrance to the mosque proved popular throughout the eastern Islamic lands. In India, and occasionally elsewhere, the idea tentatively expressed in the Damascus mosque was taken much further by heavily buttressed corner towers that gave the whole mosque an embattled air. In Ottoman Turkey, however, minarets were used most freely to articulate the mosque. Sometimes they serve to mark out the perimeter of the building as a whole; at others they cluster more closely to identify and exalt the sanctuary. Four are common and six occur occasionally in this tradition. In the nineteenth century such careful propriety was lost in a welter of attenuated minarets that festooned, for example, the larger Shi’ite shrines in Iraq and Persia. In these buildings the minaret is reduced to one motif among many, its religious and architectural character alike debased. The minaret experienced a remarkably varied formal development over the centuries. Square minarets remained the norm in the Maghrib; Egypt developed multistory minarets, each with a different elevation and ground plan; Iraq and Persia preferred tall cylindrical brick minarets, often on an octagonal or flanged plinth, whereas those of Ottoman Turkey were slender, pencil-shaped, and girdled with tiers of balconies. In ninth-century Iraq an aberrant type based on ancient Meso-potamian ziggurats, of cylindrical form with an external spiral ramp, enjoyed a brief vogue. In Saharan Africa the minaret took the form of a pylon, and examples with external staircases were also popular there and on the Persian Gulf. Predictably, minarets in the Far East and Southeast Asia were free adaptations of the pagoda. Virtually throughout the Islamic world it was the practice to give the minaret lavish applied ornamentation, whether of brick, tile, stone, or other materials. There is much less to be said about the courtyard, although paradoxically this is in some ways the most striking aspect of mosque design for the casual observer. Its impact is due largely to its size: the huge empty space gives the visitor pause and serves notice that he has left the workaday world behind him. Like the atrium of early Christian churches, the courtyard heralds the sanctuary proper and defines an area that is holy even if not used regularly for worship. There was no set form for the courtyard, but the rectangle dominates, whether the emphasis is on depth or width. Arcades or a flat-roofed portico customarily articulates the courtyard’s inner facades, while the open space itself may be punctuated by a small domed treasury, shrine, or other edicule and perhaps a minbar, pool, or dahka. These additional elements, however, are not allowed to impinge too strongly on, or to detract from, the sense of unbroken space the courtyard creates. In the larger towns the courtyard held the overflow of worshipers from the sanctuary at the Friday salat, and even in smaller centers its capacity might be required on the occasion of the ‘ids or extraordinary prayers. It was never a dead space. Islamic worship demanded mid’a (ritual ablution) as a necessary preliminary to prayer. Facilities for washing are therefore standard in most mosques. They take various forms. Sometimes they comprise a domed or open fountain within the mosque, intended for washing only. Alternatively, ritual ablution may be carried out near the latrines outside the mosque, in which case drinking water may be provided by a fountain in the courtyard. The influence of the Classical house with its im-pluvium in the atrium may perhaps be detected in those mosques (such as those of Ottoman date at Bursa in Turkey) where the ablutions facility is placed below a skylight in the sanctuary itself. In Iran and India especially, much of the courtyard is taken up by a large pool, which acts also as a landscaping feature, alleviating the bare expanse of the courtyard and introducing a broad band of contrasting color. Elsewhere, in areas where the dominant madhhab, or school of law, was Hanbali, this was not permitted on the grounds that ablutions had to be performed with running water. Water in Hanbali mosques is therefore provided by taps. None of these practices, incidentally, excludes the possibility of performing ablutions with sand where water is scarce. In the larger mosques the burgeoning size of congregations gradually highlighted a problem not previously encountered: the press of people tended to make it hard to see the imam leading the worship. The solution adopted in such mosques, from about the ninth century-, was to build a raised platform, or dakka, on which groups of muezzins would perform the movements of prayer in time with the imam and in full view of the worshipers farther back. Not surprisingly, this became distracting and the practice was largely discontinued except in mosques whose layout made it imperative. The minaret of the Yivli Mosque, Antalya, Turkey. The fluted fourteenth-century minaret of the Yivli Mosque is atypical of Turkish minarets, which generally are slender and pencil'Shaped. This tally of items constitutes a typical mosque. Islamic tradition had no place for the furnishings that are so regular a feature of Christian churches—pews, fonts, monuments, altars, and various kinds of ecclesiastical sculpture such as re-tables, reredoses, testers, choir screens and the like. Stained glass—abstract rather than figural—seems to have been used in mosques more frequently than is generally supposed, but virtually the only objects to break the puritanically bare expanse of the average sanctuary are qandib (mosque lamps). In the larger mosques these qandib, in form like a triangular candelabra, were hung by the hundreds or even thousands, suspended on long chains to just above the height of a man. The symbolic value of such lighting as a metaphor for spiritual illumination is made explicit by the practice of depicting such a lamp on mihrabs and enclosing it by a quotation from the Sura of Light (Koran 24:35): “God is the light of the heavens and the earth, the likeness of his light is as a niche wherein is a lamp, the lamp in a glass, the glass, as it were, a glittering star.” On special occasions mihrabs and minarets were decked with lights. Apart from mosque lamps the only other furnishing commonly found in mosques was some kind of floor covering. Mats of woven reeds were the most popular solution in much of the Arab world; the particular type of matting varied from sect to sect. The custom no doubt evolved from the religious requirement that all must enter the mosque unshod. Prophet Muhammad sometimes used a carpet when praying, and it is therefore not surprising that in Iran and Turkey especially—countries with a millennial tradition of carpet weaving—mosque floors were bedecked with rugs, either pile or flat-weave (kilims or yius). Luxury carpets were reserved for the great feasts, which ensjred that they suffered much less wear. This helps to explain why some of the finest and oldest carpets have been found in mosques. The more puritanical Muslims rejected such luxury as being un-Islamic. These, then, are the component parts of a typical mosque in medieval times. Most bear on the essential raison d’etre of the building, namely communal worship, but they allow for other uses too. Still other features were sometimes added to serve purposes of a less explicitly religious nature. In the great urban jamis a host of satellite functions had to be provided for, thereby greatly extending the surface area of the complex. The necessary ancillary buildings themselves sometimes served dual or even multiple functions. Education was perhaps the principal secondary function of the mosque, especially in the first four centuries of Islam. Education comprised a wide range of religious activities: the study of Islamic law and of the so-called “religious sciences” such as tafsir and fiqh; the memorization of the Koran, often carried out in a building known as dar al-qur’an or dar al-huffaz; and the study of the Hadith, or Traditions of the Prophet, for which a dar al-hadith was sometimes provided. A kuttab—a school with a very strong emphasis on religious teaching—was also sometimes sited within the precincts of the mosque. Teaching customarily took place in the sanctuary; the lecturer would seat himself against a pillar and the class would squat around him. In time, purpose-built madrasas took over the role of teaching institutions that mosques had formerly discharged, though even these madrasas might on occasion be located next to or within a mosque. To this day certain outstanding mosques are more famous for their roles as universities than as places of worship: Al-Azhar in Cairo, founded in 970 and beyond doubt the oldest continuously functioning university in the world; the Qarawiyyin Mosque in Fez, an educational institution without peer in the western Maghrib; and the Zaituniya in Tunis, its equivalent in the eastern Maghrib. The mosque maintained, throughout the Middle Ages and in some cases right up to modern times, close links with a particular facet of education: the world of scholars, scholarship, and books. It was in the mosque above all that scholars gathered for discussion, lectures, and to hear the latest works being read. Publication before the advent of the printing press meant a public reading of the work in question, validated by the presence of the author himself or by someone authorized by him in writing. Everyone thus authorized could in turn authorize others by the same process, for which the mosque was the obvious public forum. 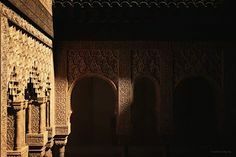 Wandering scholars, who were as much a feature of medieval Islam as of medieval Western Christianity, were accustomed to seeking shelter in mosques. These effectively took over the functions of hostelries, and some had additional features such as soup kitchens, hospitals, and even morgues. That inveterate scholar-traveler Ibn-Batuta traveled the length and breadth of the Muslim world in the fourteenth century expecting—and finding—free board and lodging at a wide range of religious institutions, foremost among them being mosques. By a natural extension of usage the mosque was an obvious early port of call for foreigners— that is, Muslims from other parts of the Islamic world. While worship was the primary function of the mosque, it was the natural setting for a series of related activities. These included sermons or theological lectures; retreats (especially popular during the last third of Ramadan and taking the form of nocturnal vigils; the systematic teaching of recitation of the Koran; the practice of dhikr, namely the ritual repetition of stock formulas, especially of praise and adoration of God; and finally the offering of special prayers, (in cases of barrenness, for instance), the sealing of oaths or covenants, and the celebration of rites of passage (birth, circumcision, marriage, divorce, and burial). Foremost among these “lesser” religious or semireligious purposes was the use of the mosque as a place of pilgrimage. This special distinction applied only to certain mosques, usually those associated in some particular way with Prophet Muhammad or with some notable saint. Naturally such mosques are more numerous in the Levant and Saudi Arabia than in the rest of the Muslim world; the most important are those at Mecca, Medina, and Jerusalem. The Hadith averred that prayers offered in such mosques were much more meritorious than those offered in other mosques, while prayer offered in an ordinary- mosque was itself worth twenty times as much as that offered elsewhere. By degrees such special sanctity was extended to mosques somewhat farther removed from the heartlands of Islam, such as those of Kairouan in Tunisia and Konya in Turkey. To this day many Shi’ites from Iran, Iraq, and the Arabian peninsula make pilgrimages to the Great Mosque at Damascus. There is a long and honorable connection between the mosque and the administration of justice; Prophet Muhammad himself used the mosque for this purpose. The use of the mosque as a venue for taking and registering oaths and for notarial acts is only one aspect of this association. Much more important in the medieval period was the custom of turning over a part of the mosque for use as a law court on set days, with the ijadi (lesser judge or magistrate) presiding. In early Muslim times this was the duty of the caliph, and the fact that caliph and qadi alike used a minbar like that of the khaiib is an eloquent testimony, as indeed is the use of the mosque for so many different purposes, of the underlying unity of so much of Islamic civilization. Equally revealing is the fact that while cases concerning Muslims were heard in the mosque, those concerning Christians were held on the steps leading up to it. Hence the high feelings that, despite the sanctity of the mosque, vented themselves on occasion in the stoning or even murder of the khatib, or conversely in the ritual cursing from the pulpit of enemies of the regime. Just as in later times the captain of a British warship had to read himself in before his authority had official confirmation, so too in medieval Islam a governor’s first task on taking office was to mount the minbar, glorify God, and read out the caliph’s letter of appointment or simply announce the fact that he had been invested with that dignity. The minbar was also the scene for political announcements and harangues of all kinds. The tradition that the mosque was a place of political asylum, like the church in Western Europe, was deeply ingrained in Islam. In some cases provision was even made to employ the mosque as a military building, with fortifications behind which the faithful could take refuge in times of uprising or war. Such bastions became a traditional feature of some mosque architecture even when Muslim society had long outgrown the need for them. These wider and in large part secular functions could in theory be discharged by masjids and jamis alike, though in practice they tended to bulk larger in the latter. There was, however, another category of mosques (usually masjids), which responded to the needs of particular groups of people. Among these were mosques reserved for certain tribes, which flourished especially in Arabia in the first century of Islam and were a potent force for disunity, and mosques for separate quarters in a town or, as a logical extension of this, for certain crafts or occupations. Sometimes mosques reflected theological differences, not only the obvious schism between Sunni and Shi’ite, but also the relatively minor distinctions between the various madhhabs. These mosques, like the tribal ones, also fostered dissension, and their legality was open to question on these grounds. There was also a category of mosque that could broadly be termed memorial. It included mosques built on sites sanctified by certain events in the life of the Prophet, including places where he had prayed as well as locations where some seminal event had taken place, like the Aqsa Mosque in Jerusalem, which commemorated his mi’raj, or night journey to hell and the seven heavens; also in this category were mosques with specific Biblical associations, such as the mosque of Abraham at Hebron. Both types recall the Christian martyrium. With them may be classed funerary mosques, which were denounced a number of times in the Hadith but drew vitality from pre-Islamic tradition in which the graves of ancestors often became sanctuaries. Prophet Muhammad’s tomb at Medina, around which developed the Mosque of the Prophet, is an example of this. By a natural transition mosques were built over the tombs of some of the great men of early Islam such as the Companions of the Prophet, and pilgrimages—admittedly unorthodox—were made to them. In time a whole complex of buildings sometimes evolved around the tomb of the notable in question. Thus a variety of functions characterized the medieval mosque, which explains the popularity of a nuclear plan onto which extra elements could easily be grafted. This innate flexibility can be traced to the origins of the mosque, which— and this cannot be emphasized too strongly—did not begin life as a primarily religious center. Prophet Muhammad’s house was more a political headquarters than a place of worship; pecple camped, argued, and even fought there. An early viceroy of Iraq decreed that the gravel floor of the Al-Kufa Mosque should be paved because people were habitually scooping up pebbles to throw at the khatib when they disagreed with his preaching. It was only by degrees that the sanctity of the mosque asserted itself. Under the Ommiads, for example, it was still permissible for Christians to enter mosques. For a long time only specilied parts of the mosque were held to be fully sacred: the mihrab, the minbar, and the tomb of a saint who might be buried there, which would be venerated for the baraka (holiness) emanating from it. Rules of behavior gradually imposed themselves. The removal of shoes became obligatory, and worshipers were enjoined not to spit (or to spit only to the left). They were required to preserve silence and decent conduct (a provision aimed at the unruly Bedouin), to ensure their ritual cleanliness, to wear their best clothes on Friday, and to observe a host of similar prescriptions. The role of women in the mosque became more sharply defined. They were to sit apart from the men, to leave before them, not to wear perfume, and not to enter the mosque during menstruation. Often a specific part of the mosque, such as the upper galleries around the courtyard or an area at the back of the sanctuary, was reserved for them. This discussion cannot proceed without some account of the major schools of medieval mosque architecture: Arab, Turkish, and Persian. Unfortunately this involves such enormous simplifications as treating the mosques of the lndo-Pak-istani subcontinent, which account for perhaps halt of those preserved from medieval times in the entire Muslim world, as offshoots of the Arab or Persian types. It also ignores the many vigorous if quasi-vernacular subschools of Islamic architecture such as those of China, Southeast Asia, and Africa south of the Maghrib. However, what follows is nevertheless intended to encompass the significant basic types of medieval mosque. There can be little doubt that the determining factor in the evolution of the mosque as a whole was Arab influence. Here the example of Prophet Muhammad’s house was of paramount importance. It is worth noting that even this structure involved some degree of modification before it could serve as a mosque, since worship was not its original function; small wonder then that many early mosques, like that at Damascus, were conversions of existing though usually religious buildings and thereby exploited the ready-made sanctity of the site. Within the first generation after Prophet Muhammad’s death the mosque of so-called “Arab plan” had established itself as a type. It comprised an open courtyard—the warm climate of the Middle East encouraged worship in the open air—with shallow, flat-roofed arcades on three of its four sides to give shade. The fourth side faced Mecca and contained a relatively deeper sanctuary, often marked by a raised transept or domes. Much of the architectural detailing was borrowed from the Classical tradition or, more rarely, from ancient Near Eastern models, and the depiction of spolia was widespread. As very early mosques at Al-Kufa and Basra in Iraq and at Al-Fustat (Old Cairo) show, the visual impact of this type of mosque could be transformed by adjustments to the depth, breadth, or absolute size of the courtyard and sanctuary; even slight variations in the depth of peripheral arcades could be telling. The window above a gateway of the Great Mosque, Cardoba. The mosque was built between the eighth and tenth centuries, the Christian choir in the background in the sixteenth century. The decoration around the window is a fine example of arabesque. Professor Robert Hillenbrand was educated at the universities of Cambridge and Oxford (D.Phil. 1974); he has been teaching at the Department of Fine Art, University of Edinburgh , since 1971 and was awarded a chair of Islamic art in 1989. Professor Hillenbrand retired in December 2007 but is currently an Honorary Professorial Fellow in the department of Islamic and Middle Eastern Studies (IMES). His travels have taken him throughout the Islamic world. He has held visiting professorships at Princeton, UCLA, Bamberg , Dartmouth College and Groningen . He has written books on Imperial Images in Persian Painting, Islamic Architecture in North Africa (co-author), Islamic Art and Architecture , The Architecture of Ottoman Jerusalem . An Introduction, Studies in Medieval Islamic Art and Architecture (2 vols.) and the prize-winning Islamic Architecture. Form, Function and Meaning (translated into Persian in 1998). He has also edited Proceedings of the 10th Congress of the Union Européenne des Arabisants et Islamisants, The Islamic Book, The Art of the Saljuqs in Iran and Anatolia , Persian Painting from the Mongols to the Qajars, The ‘Amiriya in Rada‘. The History and Restoration of a Sixteenth-Century Madrasa in the Yemen , Shahnama. Text and Image in the Persian Book of Kings and Image and Meaning in Islamic Art; and co-edited The Art and Archaeology of Ancient Persia . New Light on the Parthian and Sasanian Empires and Ottoman Jerusalem . He has also published some 120 articles on aspects of Islamic art and architecture. In 1977 he curated one of the largest exhibitions of Persian miniature painting ever held. His scholarly interests focus on Islamic architecture, painting and iconography, with particular reference to Iran and to Umayyad Syria . He has served on the editorial boards of Art History, Persica, Assaph, Islamic Art and the David Collection, Bulletin of the Asia Institute and Studies in Islamic Art and Architecture and Oxford Studies in Islamic Art. He was Islamic art adviser to the 36-volume Macmillan Dictionary of Art . He has organised nine international symposia at Edinburgh . He has also served on the Councils of the British School of Archaeology in Jerusalem , British Research in the Levant , and the British Institute of Persian Studies (Vice-President).